What can you gain from attending Toastmasters Conferences? A remarkable event happens each May in Toastmaster Districts 71 and 91 in the UK and Ireland: members and guests from across the land converge for conferences and great things happen. Thanks to the incredible efforts of volunteer conference teams, an exciting programme of workshops and keynotes are assembled for our delight, culminating in the district finals of the evaluation and international speech contests. Oh – and did I mention the partying? I was fortunate to attend both district conferences recently and came away informed, invigorated and inspired. Perhaps the most enjoyable aspect is meeting fellow Toastmasters from clubs across the land. Everyone is friendly and of course it’s hard for Toastmasters not to talk so it gets pretty noisy during the breaks! 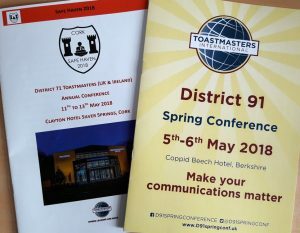 At the District 91 conference in Bracknell, I particularly enjoyed Glen Savage’s workshop on storytelling with his ‘secret sauce to sizzling and successful speaking‘, Clinton Wingrove’s talk on super-teams and the power of the word ‘respect’, and of course Toastmaster CEO Dan Rex’s keynote on leadership. The speech contest was a cracking event with some stellar performances and two amazing winners in Fabio de Sio (1) and Eric Skates (2). The following weekend in Cork, District 71 put on a packed three-day event with more excellent speakers. 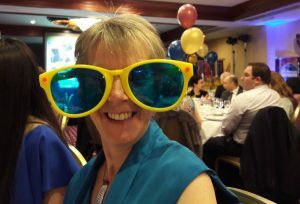 My highlights were former District Director Luanne Kent’s workshop on body language, James McGinty’s ‘Table topics for the terrified‘ which had us conjuring up as many uses as we could think for – a brick, and Simon Bucknell’s powerful keynote address. The first and second place winners of the speech contest, Deirdre Linehan (1) and Anne Dooley (2) were superb, and the high standard of the other contestants was inspiring. Norwich in Norfolk will be the location of next year’s District 71 conference on 9-12 May, and District 91’s will be in Ashford in Kent on 4-5 May. If you have the opportunity to attend, I urge you to take it and join the exuberant, lively and friendly world of Toastmasters conference. Find out what it is like to attend a Toastmasters International Convention. This entry was posted in Blog and tagged body language, conferences, contestants, District 71, District 91, excellent speakers, Leadership, speech contest, storytelling, successful speaking, table topics, toastmasters, workshop. Bookmark the permalink.